Millefiori is a glasswork technique which produces distinctive decorative patterns on glassware. The term millefiori is a combination of the Italian words "mille" (thousand) and "fiori" flowers. From Westminster Fabrics. American artist Kaffe Fassett has translated this artform into a bold print. The colors are periwinkle, mint , purple and coral on a teal ground. Millefiore by Kaffe Fassett has been used to pre cut the 5 Blocks for this quilt kit. 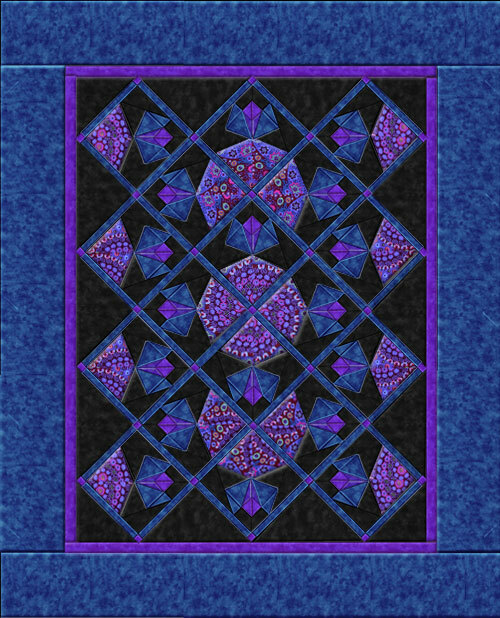 Millefiore Stained Glass Windows Kaleidoscope Quilt Top Kit finishes 46 X 56 inches and uses 5 pre cut kaleidoscope blocks that are included along with the fabric and instructions to cut the quilt top and binding. Backing and Batting are not included.